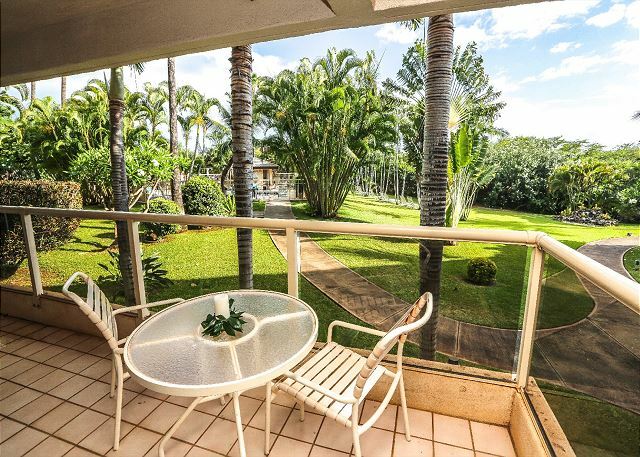 Relax on your elongated private lanai with 3 entrances as you bask in the rich Maui sun! Prepare your favorite dishes from your fully furnished, updated kitchen which includes every appliance and utensil you could need! 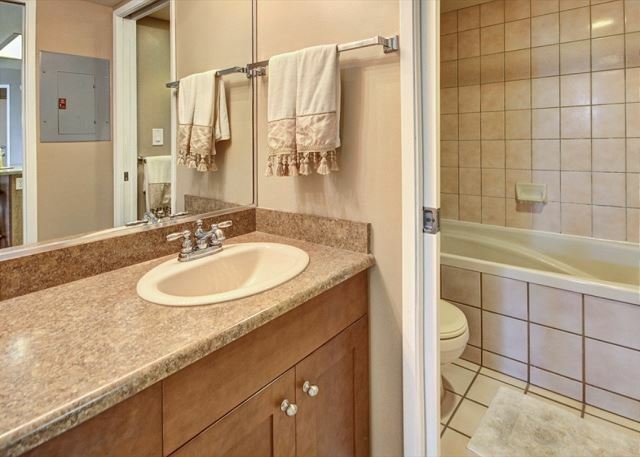 Our unit is great for families & friends alike! 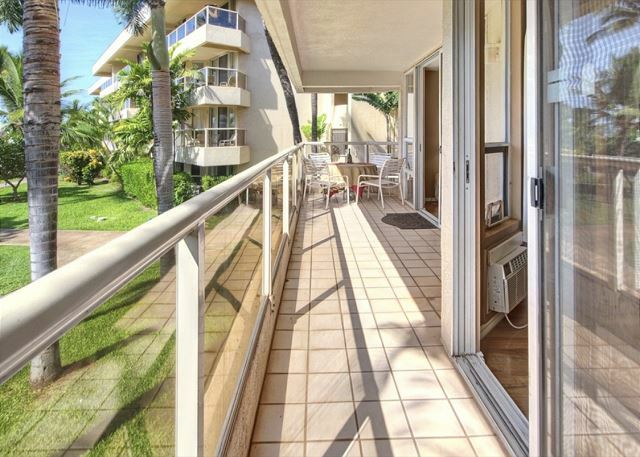 This bright and airy unit is on the ground floor but has a slightly raised lanai, allowing for many private, enjoyable meals as you dine al fresco in the cool island breeze. Located in the 'T' Building, away from the street, your lanai looks out toward the second pool area. The waist high, glass walled balcony allows for glorious garden views of the surrounding, beautifully landscaped property. 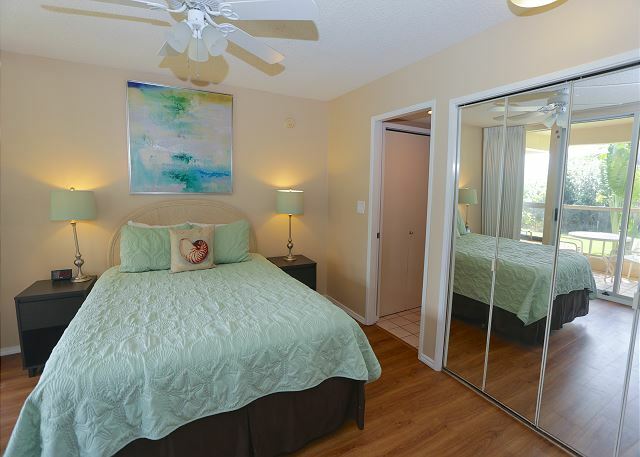 There are two AC units in the condo: One in the living room, located next to the master bedroom with Queen Bed and one in the bedroom with two full size beds. 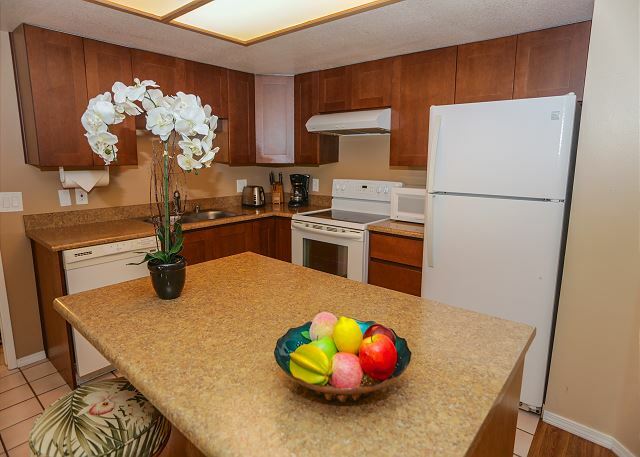 The fully furnished and updated kitchen features a nice island countertop, with seating for two. Just perfect for serving and entertaining your guests or even playing a round of cards while indulging in some fresh island fruits! But it doesn't stop there! You will also enjoy a glass-top dinner table for six to savor those delicious local or home-cooked meals! 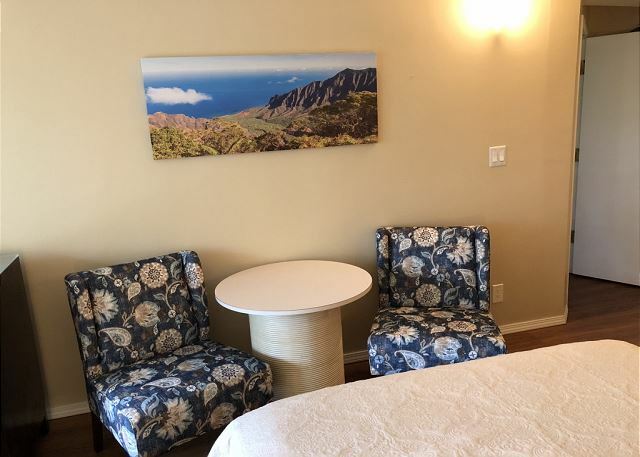 Located directly across from Kihei's own Kamaole II Beach, you will love heading out to the beach with your provided gear and sinking into the sand or rolling around in the gentle waves of the Pacific! 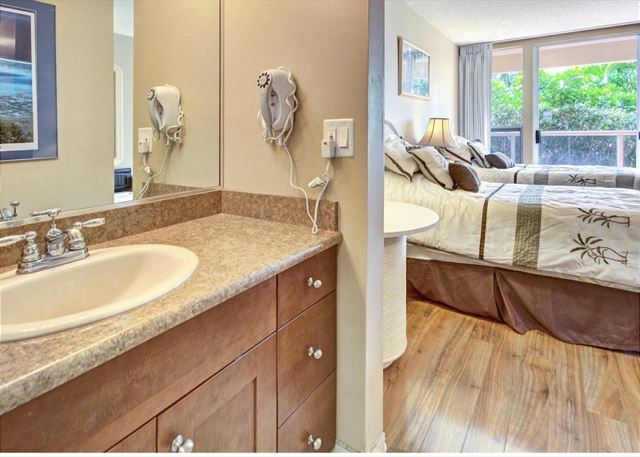 This condo has it all! From a fantastic location to spacious yet cozy interior, you must come and see for yourself..... This is your ideal spot for a perfect island getaway!! Maui Banyan's location in South Kihei is a perfect base for exploring the island and taking advantage of all that Maui has to offer. Just steps away are some of the world’s most beautiful beaches, superb shopping, renowned restaurants, and world-class golf. We are always available to be reached via email or phone. 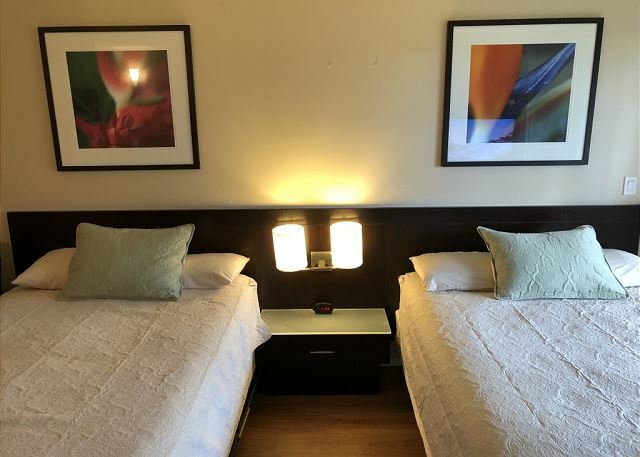 We have Housekeeping on call; additional cleaning may be arranged at an additional fee; generally our long stay guests take advantage of this service. Our Maintenance crew is on call and is available to assist at any time. Check-in and Check-out are very simple. We send you a pre-arrival email that has all necessary information on how to get to the condo, what the electronic door lock code is, pool access code, etc. We recommend you print the email prior to the trip or saving it on your smart phone to easily access it when you arrive at the complex. A private Concierge is always standing by to help with any activity bookings, island recommendations and restaurant reservations. 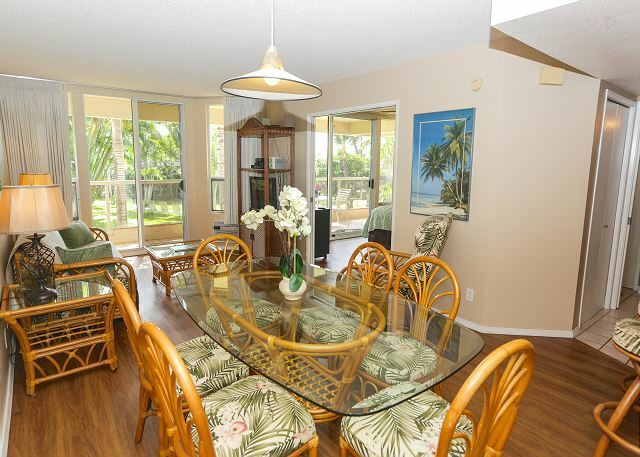 The complex is located just steps away from one of the best Maui’s beaches, Kamaole II beach restaurants, shopping, health food store and much much more. Maui’s unique and varied terrain offers a multitude of activities such as relaxing on some of the world’s most beautiful beaches to the more adventurous ziplining and paragliding. Maalaea Harbor - 7 miles - Many boats leave from Maalaea on snorkeling trips, deep sea fishing, scuba diving, whale watches (in season), sunset cruises, and more. It is much faster to leave from Maalaea Harbor than Lahaina Harbor when taking trips to Molokini Crater and Turtle Town. 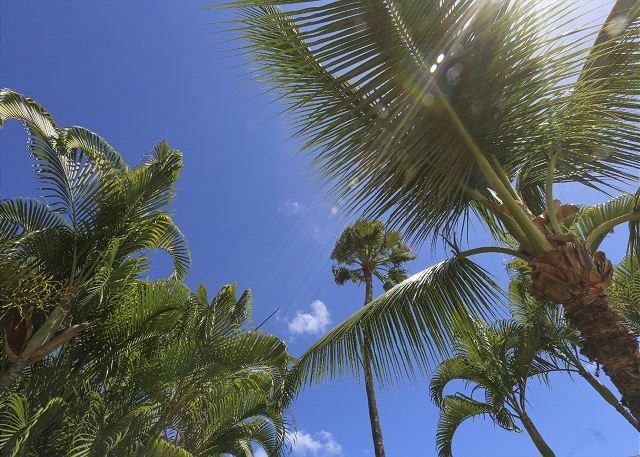 The town of Kihei, Hawaii, is a laid-back beach town offering some of Maui’s best beaches. South Maui is fun for couples and is family-friendly. You can find anything you need in Kihei including restaurants to local favorites Coconut Fish Cafe and Five Palms to the fine dining of Sarento’s. There are several shopping areas with anchor stores including Safeway supermarket and Long’s Drugs.